UPDATED: Sat., Aug. 25, 2018, 4:20 p.m.
At Ridgewood Country Club, Paramus, N.J.
PARAMUS, N.J. – Bryson DeChambeau described himself as a “man on a mission,” and he sure played like one Saturday in The Northern Trust. Now it’s a matter of which mission he’s on. 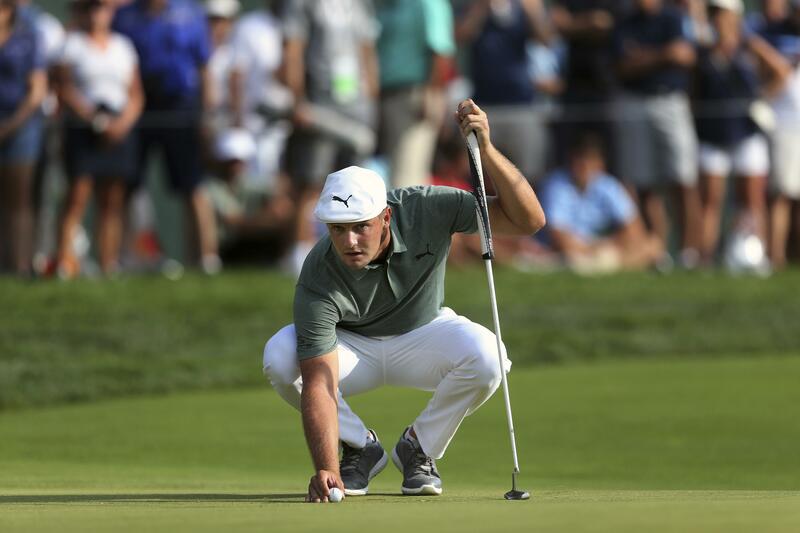 DeChambeau made four birdies in a five-hole stretch around the turn to pull away from a fading collection of stars, closed with two more birdies and had an 8-under 63 to build a four-shot lead over Keegan Bradley going into the final round of the opening FedEx Cup playoff event. A victory would assure DeChambeau one of the top seeds at East Lake to have a clear shot at the $10 million bonus for winning the FedEx Cup. “That would be something pretty special,” he said. And the timing would be ideal for his Ryder Cup hopes. DeChambeau narrowly missed qualifying for the U.S. team when he missed the cut at the PGA Championship, but a victory against one of the strongest fields of the year might be tough for Jim Furyk to ignore when he makes three of his captain’s picks a week from Tuesday. He played the part on a day when everyone else around him went the other direction. DeChambeau and Adam Scott were the only players from the last 10 players to tee off who managed to break par, and Scott had to birdie three of his last four holes for a 70. He was six shots behind. Dustin Johnson, trailing by two shots after 36 holes despite two triple bogeys, added a double bogey to his week and shot 72 to fall nine shots behind. Brooks Koepka, the U.S. Open and PGA champion who shared the 36-hole lead, began his slide with a three-putt bogey from 12 feet on No. 5 and by missing a 4-foot birdie putt on the next hole. He went 13 holes in the middle of his round with three bogeys and 10 pars and had to settle for a 72. He was seven behind. Scott was one shot behind when he made two bogeys, then chopped up the par-3 11th for a double bogey. Bradley finished his round about an hour after the leaders teed off, making five birdies over his last seven holes for a 62. He was leading at the time and figured he would be at least a few shots behind when the third round ended. He might not have expected DeChambeau to be the one he was chasing. “Just looking at who is at the top of the leaderboard, when I got to 10, I was like any birdie from here on out is really going to be big going into tomorrow,” Bradley said. Tony Finau (66) and Cameron Smith of Australian (65) were five shots behind, with Billy Horschel (65) and Scott another shot back. Jordan Spieth finally got his putter going and shot a 64, leaving him seven shots behind but in a tie for seventh, boosting his bid to return to the Tour Championship. Spieth, who hasn’t won this year, started the playoffs at No. 43. The top 30 after three playoff events go to East Lake for a shot at the $10 million prize. For players like Bradley and Horschel, making it to East Lake means getting into three of the majors and two World Golf Championships. And for DeChambeau, it’s simply the process of winning. Tiger Woods had his first bogey-free round of the year, but managed only three birdies for a 68. He was 13 shots behind. In scoring conditions, Woods has seven birdies in 54 holes. DeChambeau made that many in 12 holes Saturday. DeChambeau’s big run began from the rough on No. 8, one of the par 5s converted into a par 4 for the tournament. He carved a 5-iron onto the green to about 8 feet, made a short birdie on the next hole, hit 8-iron to 10 feet on the par-3 11th and then chopped out of the rough to below the short par-4 12th to a few inches for birdie. Published: Aug. 25, 2018, 2:51 p.m. Updated: Aug. 25, 2018, 4:20 p.m.